As the world becomes more and more digital, so do the threats that it faces. Just as we need to protect our organizations from the disruptions that occur in the physical world, we also need to have plans in place to deal with disruptions in the virtual world. As the Business Continuity Institute‘s latest Cyber Resilience Report showed, two-thirds of organizations experienced at least one cyber security incident during the previous twelve months, and 15% experienced at least ten. No longer can we think: “it will never happen to me.” Given the prevalence of the threat, it perhaps no surprise that the BCI’s Horizon Scan Report noted that, of all the possible causes of disruption, cyber attacks and data breaches were the top two concerns for business continuity and resilience professionals. 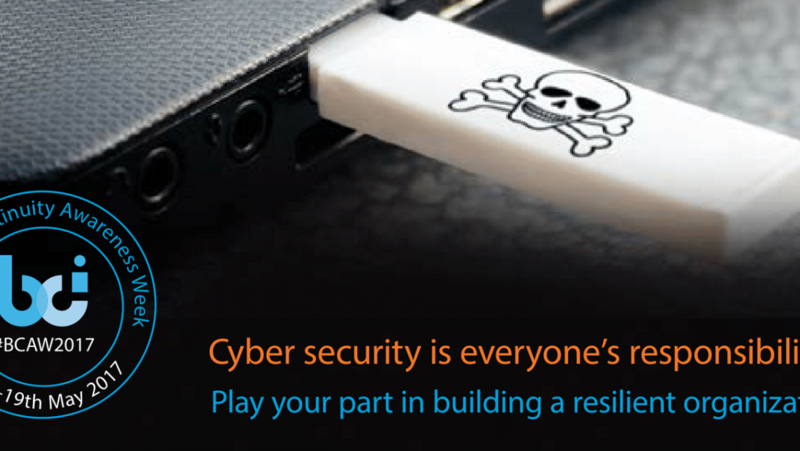 It is therefore extremely fitting that cyber security was chosen to be the theme for Business Continuity Awareness Week, an annual campaign organized by the BCI to raise the profile of the industry and highlight the need for organizations of all shapes and sizes to have a robust and effective business continuity programme in place, making them more likely to have the capability to withstand any disruption. So what can be done to improve cyber security within our organizations, and indeed in our own personal lives. They always say that prevention is better than cure so the first step is to try and prevent incidents occurring in the first place. Clearly this could be seen as the role of the IT department by ensuring there are effective firewalls in place and up to date anti-virus software on all our devices. But many studies have shown that security breaches are often the result of human error. This may not necessarily be down to malicious activity, or even negligence, sometimes it could just be down to a simple mistake. As part of the campaign, the BCI, through a series of six posters, has highlighted six simple steps that each and every one of us can take to help improve cyber security. Don’t plug in untrusted USB sticks. Don’t click on untrusted links. Be cautious when using public wifi. These all seem obvious and perhaps unnecessary to even mention them, but the report to be published during BCAW reveals the risks that our organizations face because people aren’t taking these actions, and very often display a somewhat relaxed attitude to cyber security. The posters are all free to Business Continuity Awareness Week so if you want to be part of this campaign then just choose the poster(s) and size(s) that suits and display it proudly in your office. During BCAW, the BCI will be hosting a series of free webinars that are all linked to the theme of cyber security, some focusing on the preventative measures that can be put in place to try and stop an incident happening in the first place, while others will look at the responsive actions that should be taken in the likely event that one occurs. All the webinars can be watched live, but will also be recorded so can be watched on demand at a time of your choosing. Find the full programme of webinars by clicking Business Continuity Awareness Week. The BCI will also be collating a wide range of resources, from news article and blogs, to research reports and case studies, so if you would like to find out more about the campaign then visit the website at www.bcaw2017.com. If you’re looking for some discussion on the subject, be sure to join our live Twitter chat at 1400 EDT on Thursday 18th May using the hashtag #BCAWchat. Play your part in building a resilient organization!